With a healthy payload coupled with fast transit ability, vans provide the best solution for smaller than truckload commercial freight of up to 3,500 lbs and 3-4 standard pallets. We employ sprinter vans on a daily basis throughout North America for same day shipments. 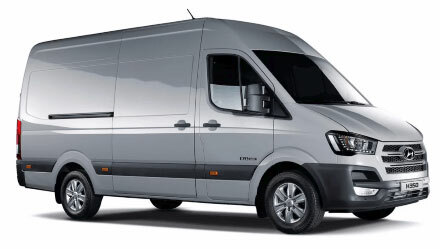 What will be very interesting to observe in the coming years is whether a portion of the sprinter van market might be owned by a new Hyundai hydrogen fuel cell van. The newest Hyundai H350 Fuel Cell Concept takes only minutes to refuel and can travel up to 260 miles on a single tank. Electric vans are currently the new direction being followed by Mercedes and Volkswagen but it remains to be seen whether the alternate fuel market may ultimately also better lend itself to the hydrogen fuel cell. For same day delivery services the vehicle range is likely to see Hyundai gain giant advantages being about double that of an electric vehicle whilst recharging the vehicle takes a fraction of the time of an electric vehicle. Seeing the vehicle taken from concept to sales may be a few years away but it is likely that by 2020 fuel cell sprinter vans will be challenging in the market. Either way it will be exciting to see the technology continue to develop.